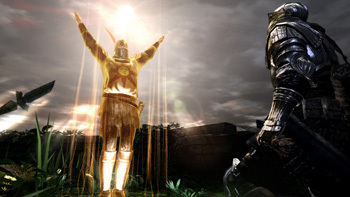 Namco Bandai is "aware" of the petition against Games for Windows Live in Dark Souls. First, the internet demanded a PC version of the console action-RPG Dark Souls. Then, when it got what it wanted, it demanded that Namco ditch Games for Windows Live and make it a Steam title - or anything but GFWL, really. And who knows? The internet might just get what it wants - again. Internet petitions are generally dismissed as vehicles of futile fanboy rage, but the 92,000 signatures calling for a PC port of Dark Souls no doubt had some impact on the decision to make it happen and notice has also been taken of the 20,000 signatures that have so far landed on the anti-GFWL petition. "We are aware of the petition against Games for Windows Live, but that's a more publishing side of the question," Dark Souls Producer and Director Hidetaka Miyazaki said in a recent interview. Speaking for the publishing side, a Namco Bandai rep took it from there. "For Games for Windows Live, that's the established server we used for our 360 version for the console - that is the main reason that we've picked the Xbox Live server," he said. "The partnership is still ongoing, so we might have another announcement regarding publishing." That's not really saying anything of value, but the important point is that the publisher is aware of the opposition to GFWL. "We (the whole European team) have been feverishly gathering all your thoughts and comments and will be approaching the development teams etc with this ASAP and we will move on from there," Consumer and Community PR Executive Hollie Bennett wrote on the Namco Bandai forums. "Don't worry your voices have not been forgotten." Dark Souls comes to the PC on August 24.